The Cisco 10GBASE-SR Module supports a link length of 26m on standard Fiber Distributed Data Interface (FDDI)-grade multimode fiber (MMF). Using 2000MHz km MMF (OM3), up to 300m link lengths are possible. Using 4700MHz km MMF (OM4), up to 400m link lengths are possible. The Cisco SFP-10G-SR-X is a multirate 10GBASE-SR, 10GBASE-SW and OTU2/OTU2e module for extended operating temperature range. It supports a link length of 26m on standard Fiber Distributed Data Interface (FDDI)-grade multimode fiber (MMF). Using 2000MHz*km MMF (OM3), up to 300m link lengths are possible. Using 4700MHz*km MMF (OM4), up to 400m link lengths are possible. *Except for version 1, which supports only 10GBASE-SR. The Cisco 10GBASE-LRM Module supports link lengths of 220m on standard Fiber Distributed Data Interface (FDDI) grade multimode fiber (MMF). To ensure that specifications are met over FDDI-grade, OM1 and OM2 fibers, the transmitter should be coupled through a mode conditioning patch cord. No mode conditioning patch cord is required for applications over OM3 or OM4. For additional information on mode conditioning patch cord requirements please see: https://www.cisco.com/en/US/prod/collateral/modules/ps5455/product_bulletin_c25-530836.html. 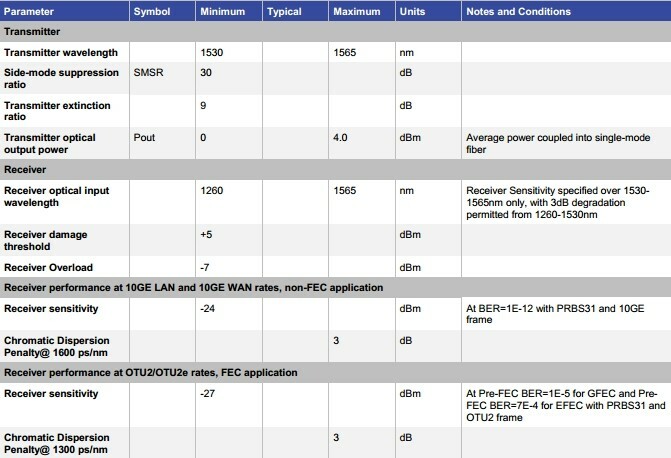 The Cisco FET-10G Fabric Extender Transceiver support link lengths up to 100m on laser-optimized OM3 or OM4 multimode fiber. It is supported on fabric links only from a Nexus 2000 to a Cisco parent switch. Note this product is not orderable individually. For more information refer to Nexus 2000 datasheet: https://www.cisco.com/en/US/prod/collateral/switches/ps9441/ps10110/data_sheet_c78-507093.html. 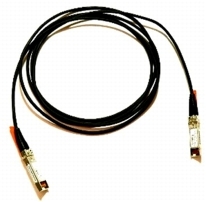 Cisco SFP+ Copper Twinax direct-attach cables are suitable for very short distances and offer a cost-effective way to connect within racks and across adjacent racks. Cisco offers passive Twinax cables in lengths of 1, 1.5, 2, 2.5, 3 and 5 meters, and active Twinax cables in lengths of 7 and 10 meters. Cisco SFP+ Active Optical Cables are direct-attach fiber assemblies with SFP+ connectors. They are suitable for very short distances and offer a cost-effective way to connect within racks and across adjacent racks. 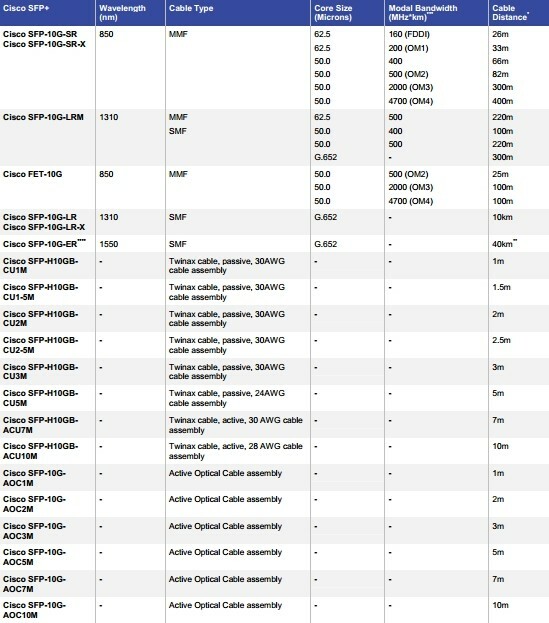 Cisco offers Active Optical Cables in lengths of 1, 2, 3, 5, 7, and 10 meters. 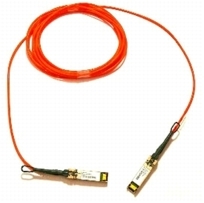 **** Requires 5 dB 1550nm fixed loss attenuator for < 20km. Attenuator is available as a spare. 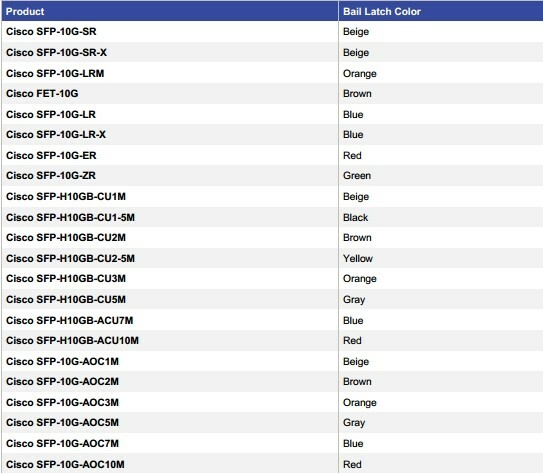 The part number is 15216 ATT LC 5=.